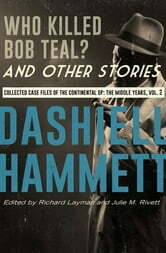 When he joins the Continental Detective Agency, Bob Teal shows every sign of becoming a crack operative. Cool headed, quick witted, and not afraid to take a punch, Teal’s on the verge of a great career when a .32 cuts him down. Two bullets are enough to kill Teal and to set the Continental Op chasing the tangled tale that lead to his demise. In “Who Killed Bob Teal?” Dashiell Hammett experimented with a premise that he would later repurpose in his most famous novel: The Maltese Falcon. But while Sam Spade is devilishly tough, the Continental Op is even tougher. And in this titular story, as well as “The Whosis Kid” and “The Scorched Face,” the Op pursues Bay-area underworld operators with the deep wrath of a San Francisco earthquake.